Water Cooler Reverse Osmosis Upgrade Kit, a separate add-on to FilterWater and G-Bottleless Water Cooler brands. Having Reverse Osmosis along the way will help remove final impurities, substantial amounts of most inorganic chemicals(such as salts, metals, minerals), most microorganisms including cryptosporidium and giardia, and most inorganic contaminants. RO is also great for applications where pure water is essential. 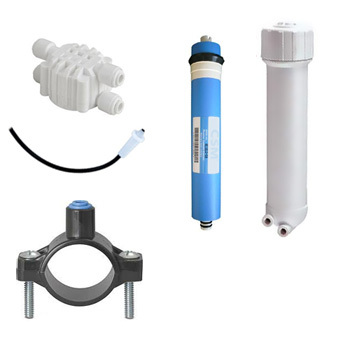 This RO upgrade kit can be installed in full-size coolers with existing 2 and 3 stage filtration system that has 2 carbon filters. You have an option to choose between 50 gpd, or high capacity 180 gpd(gallons per day) membranes. We highly recommend choosing the 180 gpd membrane if your location has more than 20 people using the machine. High quality components, US-made where possible. Upgrade with confidence. Great price too, as purchasing these parts separately would cost 50% more! Auto shut-off valve and several other components. *Use standard 1/4" OD (outside diameter), "plastic tube" water line to connect these inside your cooler and to a drain.